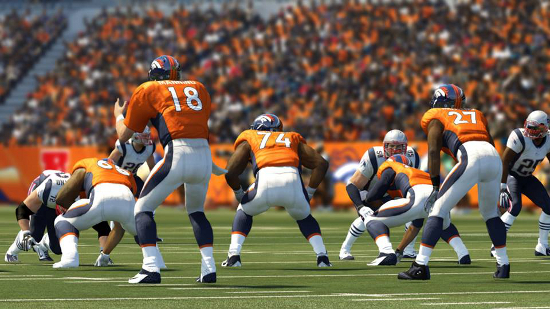 Almost two years have passed since the NFL extended the exclusive video game license with EA Sports. At the time the events made it obvious that the satisfied partner in the relationship was the NFL and not EA. It was evident that EA would later seek to secure much more favorable terms come negotiation time. An extension to the exclusive license has still not been announced. In the past that news has come in February (2008 and 2011) each time two years in advance of expiration. Now though the current deal is set to expire next month and there have been no updates from either side on how things will proceed. EA had the leverage going into the process. The NFL has been happy with the partnership to date. The exclusive deal has brought in four times as much money each year as when multiple licensees paid in and they’ve been able to enact a level of control over the product that projects the image the league desires. The NFLPA loves the arrangement too because it brings in the most money possible. For the league to turn to a different company would mean likely no NFL game on the market for at least two years and that is an unthinkable scenario. Unlike partnerships related to apparel, uniforms, beverage, and the like there is a turnaround time and a greater sense of uncertainty that would come with switching video game developers. Though now they are expected to extended NFL Sunday Ticket with DirecTV at one point they strongly considered going elsewhere with it when DirecTV questioned its value. That is similar to how EA Sports has felt as development costs increased coupled with shrinking sales. The common thread however with how the NFL handles its brand is exclusivity. It would go against their M.O. to open up a license to multiple parties. That doesn’t mean it couldn’t happen. EA Sports has no reason to pay a premium for the exclusive when the threat of competition is thin even if other companies had the opportunity to buy in. The investment for a new company to begin from scratch would be enormous beyond whatever enter fee there would be for the license and then there would only be the potential of splitting the pie with EA who has one of the strongest brands in gaming history with Madden. Still it’s a more realistic scenario than new serious competitors entering the field in other sports. EA Sports continues to develop Madden NFL 15 and there have been no indications that the license is in question for this year. At the very least they seem to have secured a limited extension yet there has been no official announcement of details. That they have avoided addressing the topic suggests there very well could be a change to the status quo and the news on that being held until the completion of the NFL season and the expiration of the previous deal. Neither side gains from the perception of uncertainty so if an agreement for extending the exclusive has been reached there would have been no reason to hold an announcement back. No one should get their hopes up too high of a change to the way the NFL license is handled and who will be involved developing officially licensed games. However there is reason to believe that a change of sorts is plausible. February or early March would be the time when details will have to be shared regarding any parties attached through a deal. The era of THQ wrestling games is officially over. As of this afternoon, THQ as a company has been dissolved and all of it’s licenses and properties have been auctioned off. We know where several prominent franchises and studios are going but we simply have no idea on where the WWE video games license has found as a home. What we do know is that a new company will definitely be publishing WWE games starting immediately. The Twitterverse is abuzz with rumors that either of both EA and Take Two have bought the license — and it would stand to reason that one side of the other is correct. The WWE was owed $45 million from THQ when the company went under, so most likely WWE will be looking for a stable and somewhat wealthier business partner this time around. The status of a WWE game for 2013 will depend upon how the new publisher approaches WWE video games. If the publisher starts from scratch, there may not be another WWE game on the market for at least a year or two. A formal court document shows that WWE’s license was NOT auctioned off in the sale of THQ’s assets. This tends to indicate WWE cancelled their licensing deal with THQ and has shopped or is shopping their property unilaterally.